Five: each elderflower has 5 petals, 5 yellow stamens, and 5 sepals which form a tiny green star. Thirteen: Elder is associated with all superstition surrounding the number 13. Traditionally all parts of Elder are useful medicinally. The berries and the leaves are both rich in vitamin C. The leaves can be made into ear drops to treat pain and inflammation. The flowers make a tea that is good for treating coughs and irritable throats, as well as being made into a skin cleanser and lotion. The bark of the new small twigs can be made into a laxative. The bark, roots, berries and leaves can all be used as a dye. And the berries are good for making jam, wine, vinegar, and syrups. The leaves and berries are used for protection and in breaking spells that were cast against you or to undo spells of evil intent. 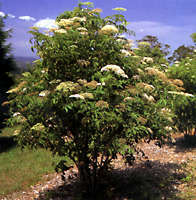 Growing an elder in your garden will protect your property from misfortune and harm. In Europe they planted elder in cemeteries to keep away the evil spirits. 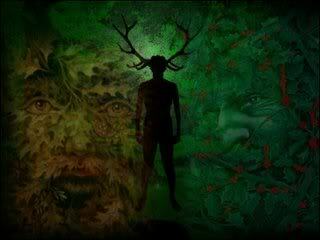 The elder is a tree of beginnings and endings, of birth and death, so the elder fairy is a spirit of transformation and the crossing of thresholds. 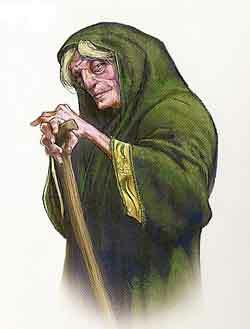 Generally seen as an old woman, the elder fairy advises on what to cast away and what to take up. She may provide a potent link with the Mother Goddess and facilitates contact with spirits of other trees. In a sense she acts as a mother figure within the woodland. She carries the wisdom of the Crone, and is mistress of the deepest magic. Witches were said to be able to turn themselves into elder trees. Gypsies believe that it is very bad luck to cut down and burn elder wood and that the Elder Mother will take revenge. This superstition arises from an instinctive realization that a lack of respect for Nature is dangerous, ultimately, to the human race. Elder’s unruly growth hints at the untamable aspect of Nature, the black heart of the earth to which we owe our being. Elder fairy has an aged, feminine wisdom, too long mispriced in our culture, but with a little respect she will act as teacher.